The Superbowl is coming up very soon and I thought what better than to do some football party cupcakes! So I grabbed my mom and we did a D.I.Y. 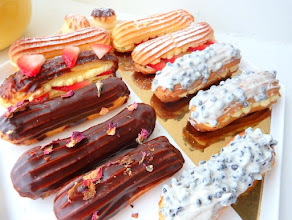 tutorial on these delicious treats. We had so much fun making these. 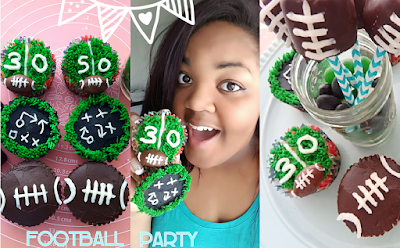 We also made football marshmallow pops which you can find in the video tutorial above. By the way, if you haven't experienced a chocolate covered marshmallow, I think now is the time. Start by spreading an even layer of black buttercream over the cupcake. Make sure that the entire cupcake is covered. Using Ateco tip #2 and white frosting, pipe your "play" onto the cupcake. To do so, pipe a few x's, o's and arrows. Lastly, using the green buttercream and Wilton tip #233, pipe a grass border around the edge of the cupcake. Cut off the dome top of the cupcake to create a flat surface. Using Wilton tip #5 and the white frosting. Pipe one line in the center of the cupcake. Once again with the "grass" tip and green buttercream, pipe grass on both sides of the line. Fill in the cupcake completely with grass to make sure none of the cake shows. Decide how many yards you'd like to pipe onto your cupcake. If these are for a birthday party, consider piping an age on the cupcake. Whatever yard line you choose, remember to pipe one number on the left and one on the right side of the line. As seen in the picture. Remove the tootsie rolls from the wrapper and place on a microwave safe plate. Melt the tootsies in the microwave for a few seconds (about 10) until soft. Carefully (it will be hot) knead the tootsie roll into a ball, then pinch two sides to form into a football. 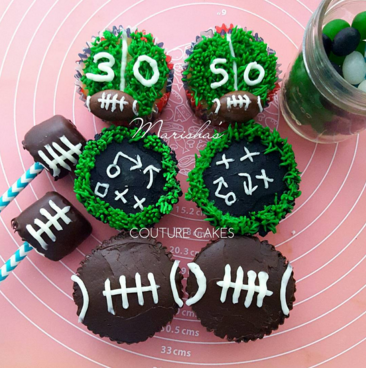 Place on the cupcake and pipe football lines onto the mini football. This one is super easy. Spread an even layer of chocolate frosting onto your cupcake. Using the white frosting and Wilton tip #5, pipe the football lines onto the cupcake. I started with the long line going down the center, then a few cross-over lines. End with the two curved corner lines and VOILA! 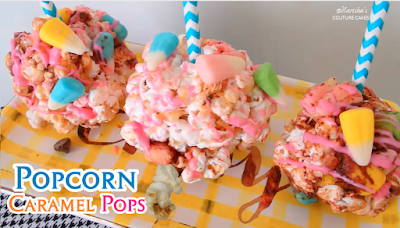 Watch the tutorial for the bonus marshmallow pops seen in the pictures. Enjoy!! Fall is a most loved time for the decorator in every one of us and football is a particularly rich wellspring of occasional pictures. Stadiums loaded with cheering fans, homecoming parades and rich gather subjects blend to shape the football party style.